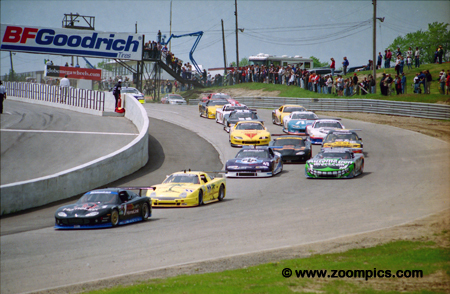 2000 marked the 35th season for the Sports Car Club of America's Trans-Am Series. The rights to the series were acquired by Ralph Sanchez and Don Panoz. BFGoodrich tires was the title sponsor. The twelve race season opened at Sebring, Florida in March and ended in November at San Diego, California. There were a number of technical changes for 2000. The most obvious was the introduction of a spec rear wing. The spec wing was introduced as a means of equalizing the downforce of the cars while maintaining a more production-based appearance. It was felt that the use of a rear spoiler distorted the car’s original lines. There was also new eligibility for a broad range of auto manufacturers and models. As a result the grids which were traditionally filled with Ford and Chevrolet products now included the Jaguar XKR, Qvale Mangusta and the Oldsmobile Aurora. 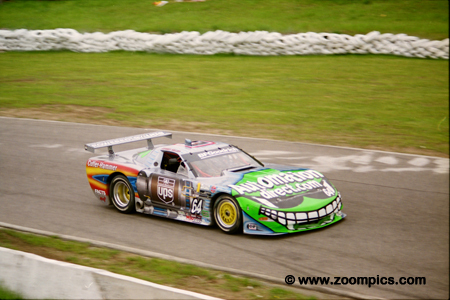 Mosport was round four of the 2000 Trans Am championship and the feature event of the weekend. The race would be 40-laps around the 2.459-mile, ten-turn road course. The entry included 37-drivers which was a new record exceeding the previous mark of 35-drivers in 1981. 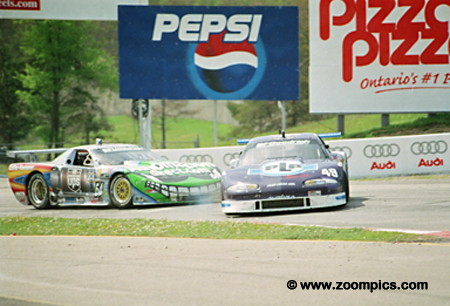 Corner one and the start of round four at Mosport. Pole-sitter Paul Gentilozzi in the Jaguar XKR takes the lead with the Qvale Mangusta of Brian Simo in close pursuit. 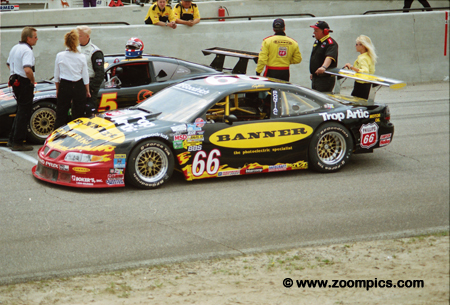 Behind them are third and fourth place starters – Randy Ruhlman and Johnny Miller. These two would battle throughout the 40-laps with their fate being decided on the last lap in the last corner. The previous round at Long Beach was a controversial race. After the appeals were resolved Tomy Drissi was declared the winner. The driver of the No. 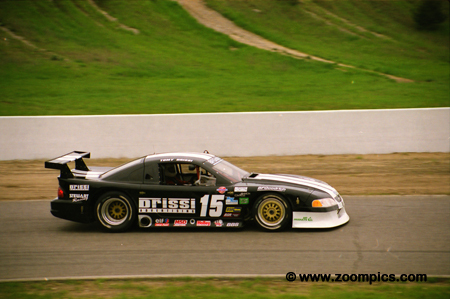 15 Ford Mustang qualified ninth at Mosport. He was able to improve upon his starting spot and captured the final podium position as the result of the last lap incident. Pole-sitter Paul Gentilozzi and second fastest qualifier Brian Simo would run in tandem until lap-30 when Gentilozzi spun at Moss corner. 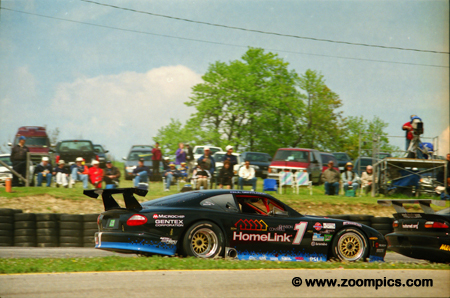 With too much rear brake bias and no one to blame but himself, the 1999 Trans Am series champion worked his way back from fifteenth to finish in seventh place. Former F1 and sports car builder Alejandro de Tomaso revived the Mangusta brand in 1996 and with some help from, US importer Bruce Qvale introduced the model to the American market. Unfortunately, de Tomaso and Qvale had a falling out which led him to drop his name from the cars and they were built in Italy as the Qvale Mangusta. Randy Ruhlman in the No. 49 Oldsmobile Aurora and No. 64 Johnny Miller were in a race long battle for third place. On the final lap in the last turn, Miller bumped Ruhlman while trying to make a pass and took both drivers off the track. Ruhlman finished eighth and Miller was penalized for his move, which dropped him to ninth place. Leighton Reese qualified the No. 66 Pontiac Grand Prix sixth. Unfortunately, mechanical issues caused him to retire after only 14-laps. 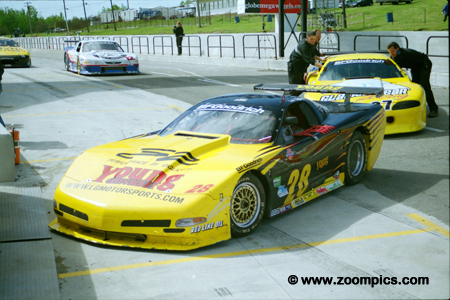 Later in the season at Texas Motor Speedway would score Reese first Trans Am series victory. 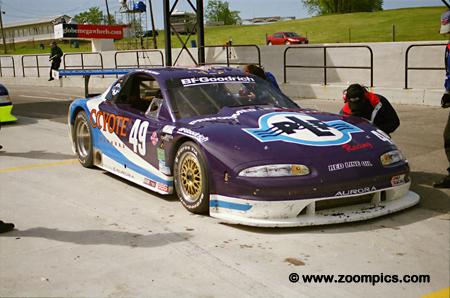 Rookie Jeff Altenburg was part of Paul Gentilozzi’s Rocketsports team. 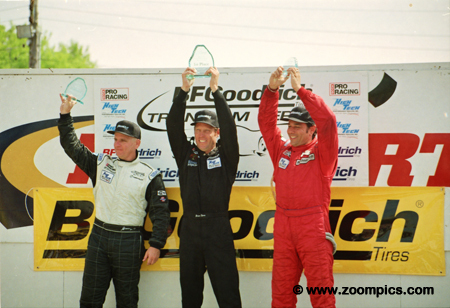 At Mosport Altenburg started fifth and with a bit of luck and good driving finished second – he also benefited from the incident between Miller and Ruhlman. 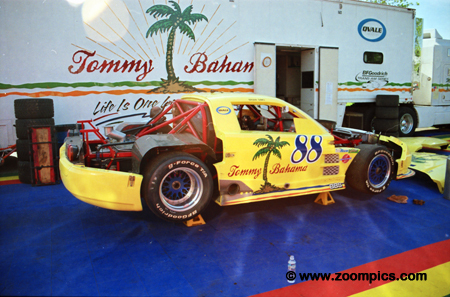 He would go on to finish third in the final standings and win the 'Rookie of the Year' award. The only Oldsmobile entered in the race was the Aurora model of Randy Ruhlman. Ruhlman qualified third which was a career best effort. He waged a race long battle with Johnny Miller and looked set for a second place finish until the incident with Miller on the last lap in the last corner. A last lap incident in the previous round at Long Beach caused Trans Am series officials to base the results on a 34-lap race. In the weeks following the event, an appeal by Joe Huffaker and a review by SCCA Pro Racing reinstated the lap-35 results. Johnny Miller in the No. 64 Corvette was the winner of the 34-lap event but as the consequence of the appeal he was classified in fifteenth. As the result of Randy Ruhlman’s misfortune and Johnny Miller’s penalty Lou Gigliotti inherited a fourth place finish. 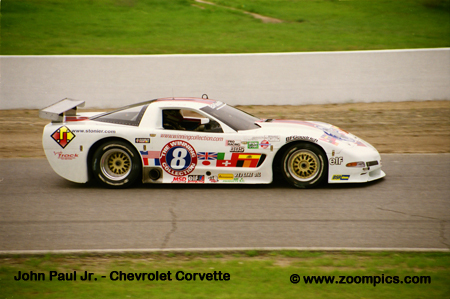 The Chevrolet Corvette driver qualified thirteenth. 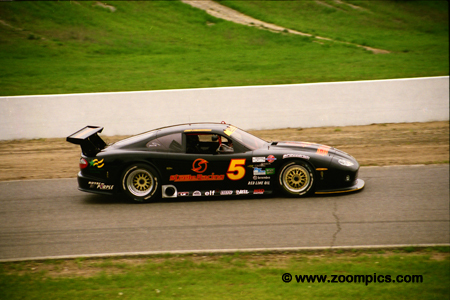 After four events in the 2000 season, Gigliotti’s consistent finishes meant that he was fifth in the Driver’s standings after Mosport. The podium at Mosport. On the left is second place finisher Jeff Altenburg and the right Tomy Drissi, who captured third. Between these two is the winner Brian Simo. Altenburg and Drissi were able to finish on the podium by capitalizing on the incident between Ruhlman and Miller. 29 17 James Holtom Chevrolet Corvette 32 N.A.